★The Japanese original version of this policy represents the legal basis. The following English translation is made for reference purpose only. Any personal information you submitted to Pasona Global Department, Pasona Inc. (“the Company”) at [Job Fair] through seminar applications, inquiries, questionnaires, requests, will be used for purposes listed below. 1）For reception and correspondence when participating in [Job Fair]. 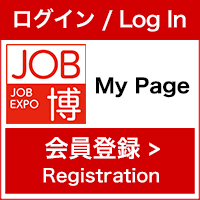 2）To provide personal information to employment of staffing agencies of the Pasona Group to supply the participants the best job introductions, information about jobs, interview guidance, information about job hunting events, e-mail magazines,or to implement surveys, after [Job Fair] is finished. 3）For contact and inquiries concerning [Job Fair] and related matters. 4）For correspondence and inquiries regarding to changes of information. 6）For purposes corresponding to the administration/offer of other services related to [JOB　Fair].You will be informed in advance in the event of use for purpose other than those listed above and we will ask for your consent. Your home address of national origin (“Home Address”) in the country of your nationality will be collected in order for the Company to provide the Service internationally. For Group Companies and participating companies in Job Fair to expand opportunity to provide job information. Therefore, these Group Companies and participating companies of Job Fair may contact you directly to provide their services or job information to you. Since such services shall be provided to you directly by these Group Companies, if you wish to use the services, you will be required to accept their terms and conditions of the services. Name, date of birth (age), address, Home Address, contacts information. To provide computerized personal data of personal information by electronic method including but not limited to e-mail , internal database system or registration sheet. The Company has entered into confidentiality agreements with Group Companies and participating companies in [Job Fair] to protect and securely manage personal information, and will make every commercially reasonable effort to protect personal information. Within the scope of the purposes outlined above, the Company may provide collected personal information to outside contractors with whom it has entered into confidentiality agreements. Before the provision of personal information to the contractors, the Company will review their guideline of personal information and strictly examine the contractors. The Company shall be liable for the treatment of personal information by the contractors. 5.The Company does not compel you to disclose personal information, however, services provided through and after [Job Fair] may be limited. The Company strives to manage your personal information in the most accurate, up-to-date fashion as possible. Notification of purpose of use, disclosure, correction, stopping the use, erasing or stopping the provision to the third party as well as other complaints should be addressed to the contact below. On these requests, proof of identification and confirmation of content will be necessary, so please apply by filling out the prescribed form and consult us by email or in writing. Copyright © 2019 Pasona Global Corporation. All rights reserved.